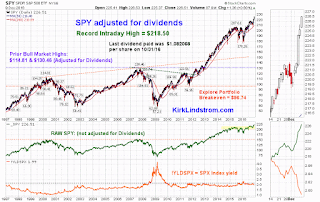 Mar 03 SPY Up 9.5% Since The Tradable Low - Buy Pullbacks Or Sell? Subscribe NOW and get the Current Month for FREE!!! This graph shows the market data graphically for 2016 through 12/30/16. 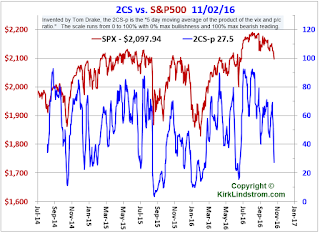 The S&P500 is 22.40% from its February 11th closing low, the day I wrote this free article "With SPY Down 14% Again, Sentiment Charts Suggest Another Tradable Low"
The Russell 2000 (small cap index) is up 42.30% since the February 11th low. 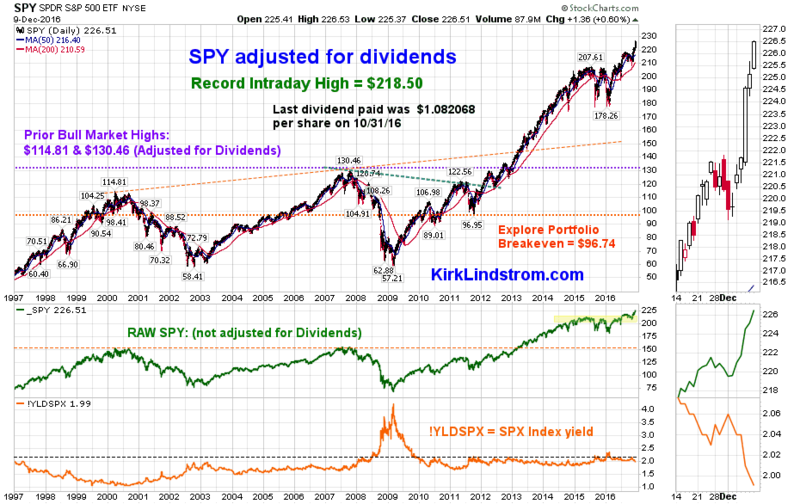 Feel free to verify with my subscribers who post on my Kirk Lindstrom's Investment Letter Facebook Page. 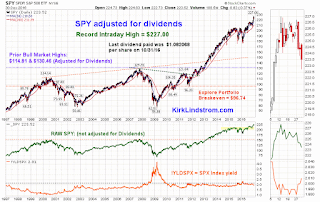 This graph shows the S&P500 ETF SPY and its dividend back to 1992. This graph puts the Dow Jones Industrial Average into perspective using a log chart. Many pundits on TV say lowering the corporate tax rate will allow hundreds of billions of dollars to return to the US where some will be used for share buybacks. This buying by companies plus scared bond investors looking for return, could easily drive the Dow back to the center blue line... of course a bear market could also drive it to the lower blue line first so I take profits at new highs to have funds to buy the declines and thus beat the market over time like very few others have. Subscribe NOW & get the December 2016 Issue for FREE!!! 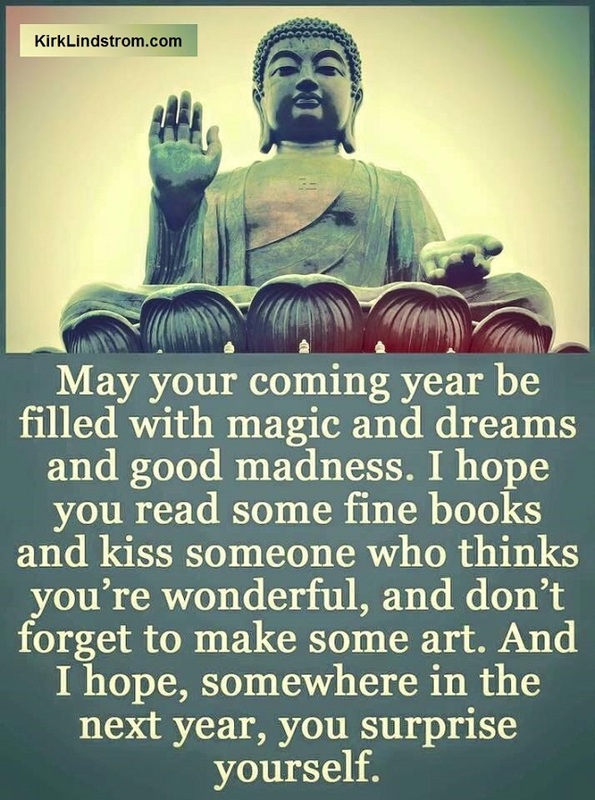 Congratulations to everyone who is in the stock market this year! get the December 2016 Issue for FREE!! 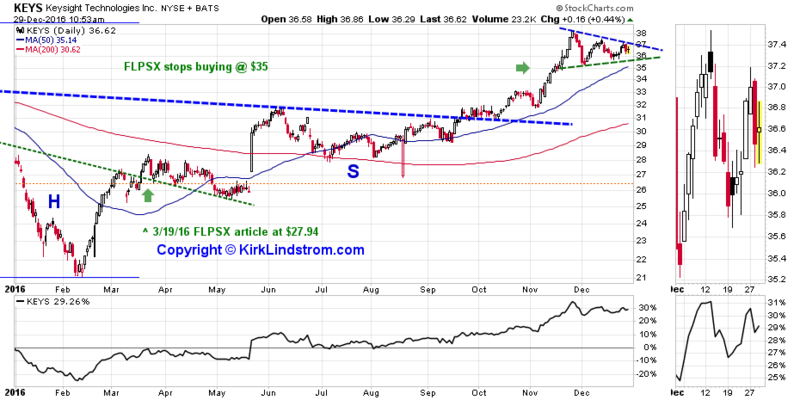 This chart shows KEYS is up 29.26% YTD with a bull flag pattern stretching from mid November through today. 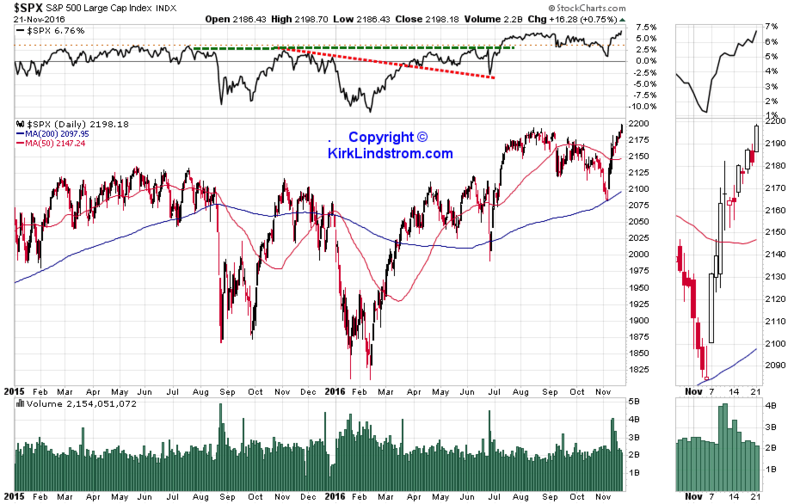 This next chart shows KEYS has an "Inverted Head & Shoulder" pattern stretching from May 2015 through mid September 2016. The break of this dashed blue neckline was bullishly tested from above in October 2016 before the big jump to $38 in November 2016. 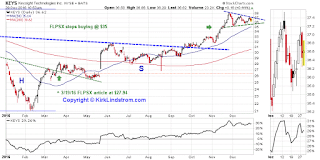 Here is a great "Pro" article at Seeking Alpha "Keysight Technologies: An Intriguing Bull Case, But It Looks Priced In" that basically says "Keys was a great buy when Kirk was buying in the $20s and low $30s but not so great now after he took profits!" I believe one reason we are seeing a major "pause" here is Fidelity's Joel Tillinghast said in March that he would stop buying it for his stellar $35B "Fidelity Low-Priced Stock fund" at $35 so he's probably done what I did and take some profits. See Barrons "Fidelity’s Tillinghast: How He Beats the Market"
"Keysight can improve its profitability as a stand-alone company and might possibly be an interesting acquisition. Oftentimes, the second part of the story to spinoffs is that they get reacquired. It might be, by another instrument company. Keysight trades at $26 and is earning not quite $3. On a quarter-to-quarter basis, growth looks a little volatile, but less so on a yearly basis." I was fairly aggressive buying KEYS for my "Explore Portfolio" in the low $30s and $20s and have already taken some profits with a break-even price now down to $26.47. and get the December 2016 Issue for FREE!! Labels: KEYS, Keysight Technologies Inc.
Below is my chart of Dow Jones Industrial Average Index (Dow or DJIA) trend lines with "Irrational Exuberance" and "Irrational Pessimism" charted from 1980 through today. 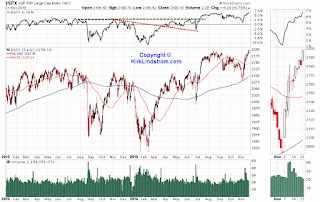 Market Update - US Stock Markets All Made New Record Highs!!! On Friday December 9, 2016 all major U.S. stock market indexes closed at new record highs. 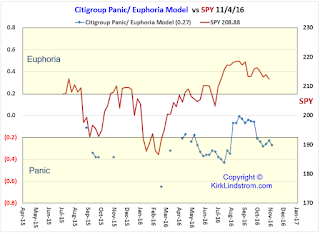 The S&P500 is 23.53% from its February 11th closing low, the day I wrote this free article "With SPY Down 14% Again, Sentiment Charts Suggest Another Tradable Low"
The Russell 2000 (small cap index) is up 45.54% since the February 11th low. This graph shows the market data graphically for 2016 YTD. 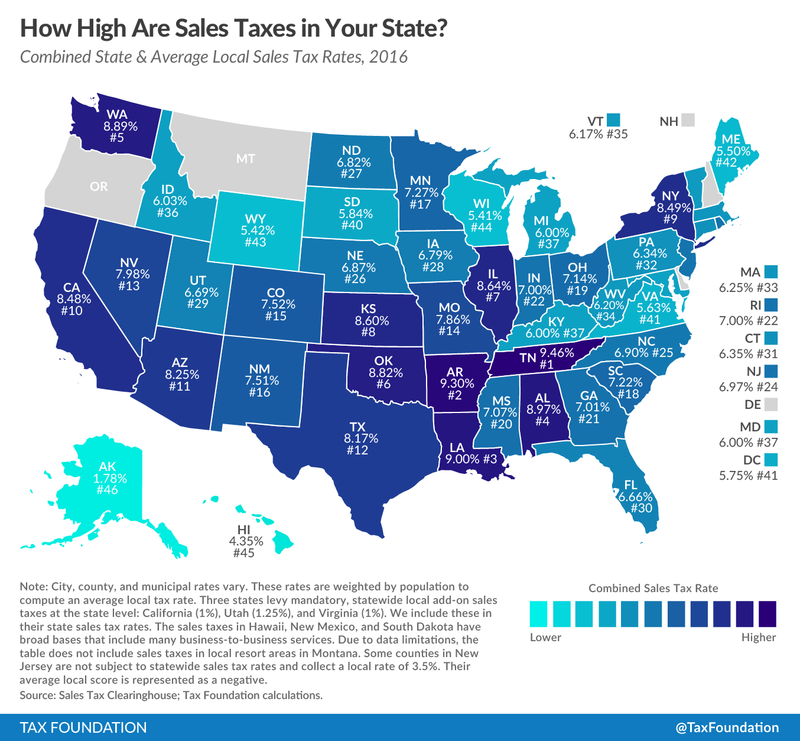 This graphic shows the estimated, combined state and local sales tax rates for all 50 US states for the 2016 tax year. 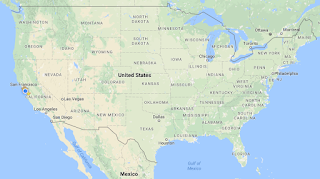 Of these, Alaska and Montana allow local cities and/or counties to charge local sales taxes. California (aka Taxifornia) has the highest state sales tax at 7.5% but 1% of that must be distributed to local cities so you could argue it should only be 6.5% on that map. Walczak, Jared. “Chicago Adopts Highest Sales Tax Among Major Cities.” Tax Foundation. July 16, 2015. http://taxfoundation.org/blog/chicago-adopts-highest-sales-tax-among-major-cities. 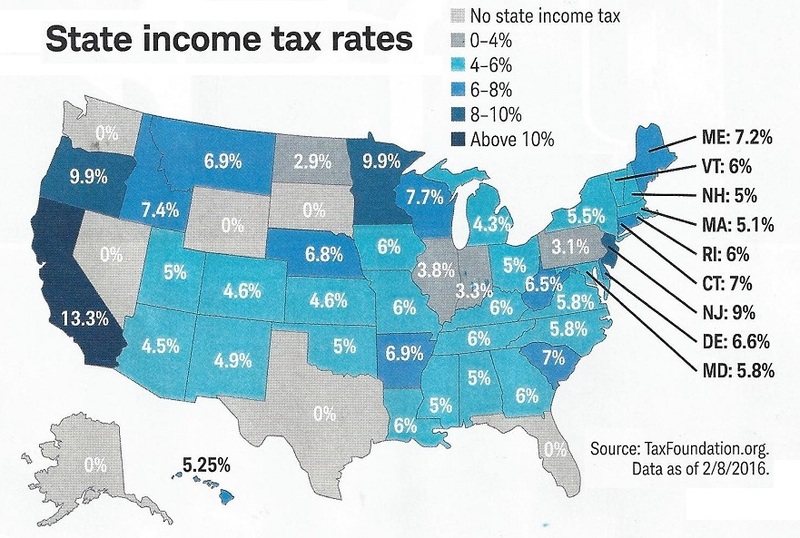 This graphic shows the state income tax rates for all 50 US states for the 2016 tax year. 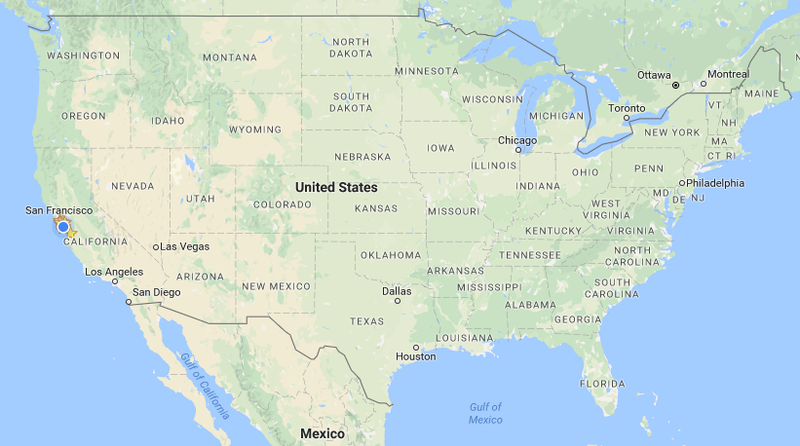 The top rate is California with 13.3%!! 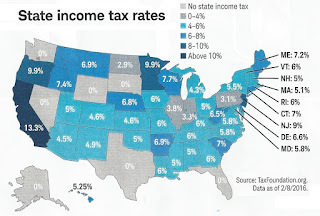 The bottom rate is a tie with 7 states that have no state income taxes. 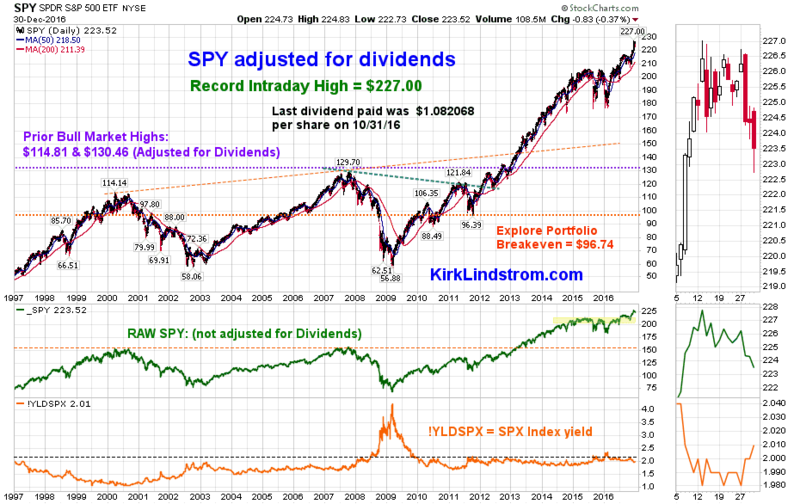 What a great year for stock market investors! Today all major US stock markets closed at new record highs! The above table shows the Russell 2000 small cap index is up 38.6% from its Feb. 11, 2016 closing low when I wrote there was a ANOTHER tradable low. I made great money buying the first low in 2015, taking profits as the markets recovered then bought again when the market was testing that low in early 2016. Subscribe NOW & get the November 2016 Issue for FREE!!! This is fascinating how you can put a decimal point after the first digit of the speed of light and it gives you the Northern Latitude for the oldest Egyptian pyramid. 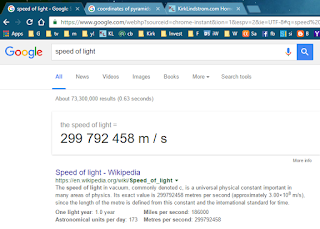 The speed of light in vacuum, commonly denoted c, is a universal physical constant important in many areas of physics. 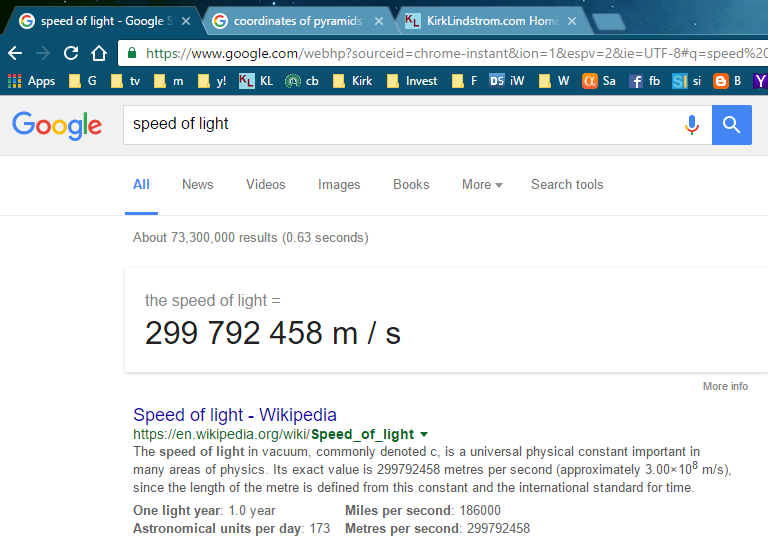 Its exact value is 299792458 metres per second (approximately 3.00×108 m/s), since the length of the metre is defined from this constant and the international standard for time. Why is the speed of light also the coordinates for the great pyramid at Giza? Gremlins: Mr. Love, my 8th grade advanced science teacher who later taught the MGM program for the district taught us to attribute everything to "gremlins" then use science to come up with a more plausible explanation. 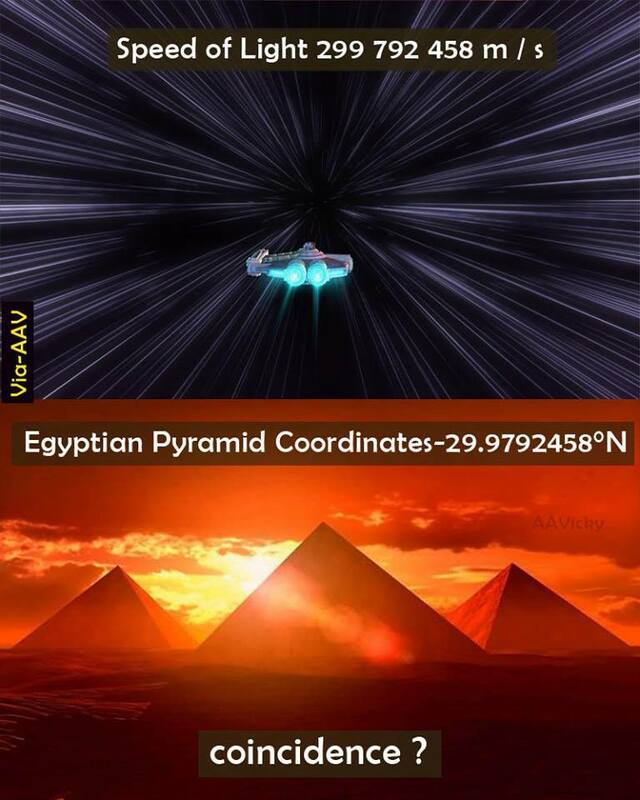 "Space Aliens" visited the Earth and helped construct the Great Pyramids. 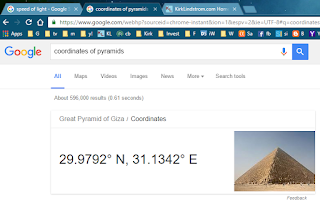 They used coordinates that would someday leave a message to a more advanced people that they visited our planet and perhaps even helped us survive as a species. Subscribe NOW and get the October 2016 Issue for FREE!!! 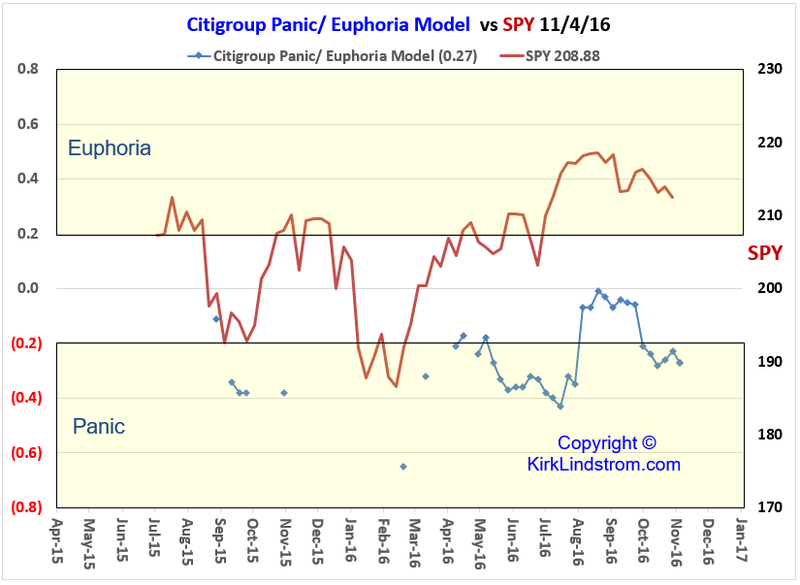 Note: Some articles I've found suggest Citigroup's Panic/ Euphoria Model completely missed the financial collapse in 2008 so the model was "reformulated." 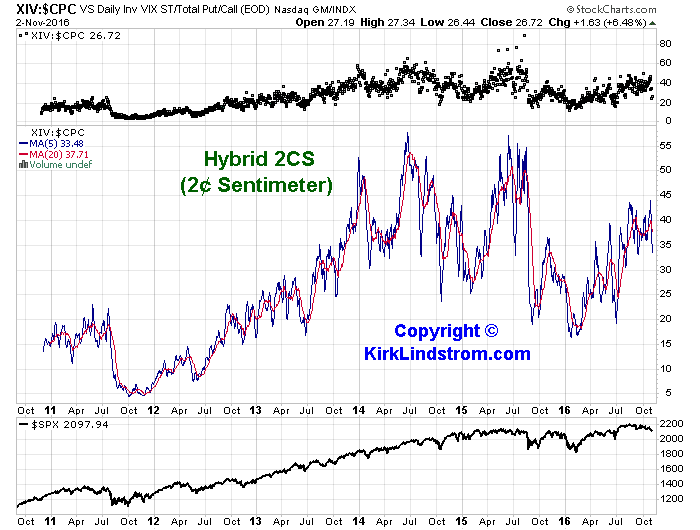 My guess is it is like most sentiment models in that its more useful to look at rate and direction of levels rather than absolute levels. The 2CS Indicator History as of today's market close has fallen into what has typically been a very good "buy zone" for those with patience. When used as a contrarian indicator, the scale on my graph below runs from 0 to 100% with 0% the maximum bullish reading and the 100% maximum bearish reading. 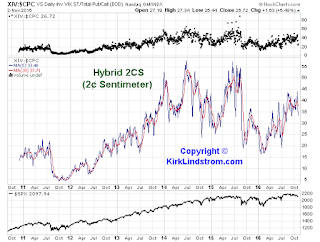 Here is another version I call my "Hybrid 2CS"
In the past two years, buying the S&P500 when the 2CS was under 30 has yielded good results within a few months. Buying when under 20 has produced even better results.Will this trend continue?